We had a wedding to attend just outside of Charleston, South Carolina, and when I looked at flights, I realized something obvious: flying to Charleston on a Friday during the summer is not cheap. But there is one thing that makes it cheaper, and that’s having a Southwest companion pass. We needed an early flight, so Southwest’s morning option through Denver (can you believe it flies Denver-Charleston?) fit the bill. At $257.80 for one us, $297.80 for each of two more, and then my wife at only $5.60, this was a pretty good deal. I had trouble sleeping the night before, and when we got up at 3:45am, I felt like I had barely napped at all. We gathered everything, scooped the kids out of bed, and then took a Lyft up to LAX. Thanks to very little traffic, we arrived about 5:15am to find a busy Terminal 1. On the inside, I went to check a couple bags. I hadn’t flown from Terminal 1 in awhile, so I was interested to see what progress had been made in the never-ending renovation. The old escalators that took you up to security are long gone and there’s no real trace of them at all anymore. It’s just a walkway with bathrooms that leads over to the security area. The security line was short, and on the other side, we took the new escalators up to the concourse level. We walked over to the area where security used to let you into the concourse, and it’s mostly gone. The only remains are the two escalators that go down to baggage claim. Those haven’t moved. It looks like the whole area will be an Urth Caffe. The old food court is behind walls as well. We walked to our gate, and I couldn’t help but flash back to what the terminal used to look like. It really has been transformed. We sat in the gate area as a long line of wheelchairs lined up for pre-boarding. Our chipper gate agent got them onboard and then began regular boarding. We hopped on during the family boarding after the A group. We were able to grab two sets of window/middle seats behind the wing once onboard. The flight was completely full, and we were on our way right on time. The flight attendant came through with Belvita crackers and… no peanuts. This was day 3 of the new peanut-free Southwest. As we got toward Denver, it started clouding up below us. Just as my son decided he desperately needed to go to the bathroom, we were told it was going to be bumpy and they were buttoning up the cabin early. We figured we still had a minute or two so we made a break for it. Despite a few bumps in the cloud tops, we made it back to our seats unscathed. It was a pretty ugly day in Denver, as you can see. But it’s hard to complain when you land early and have a gate waiting for you. Then again, in this case, it just meant our layover would be longer. The kids were already wound up, so we headed over to the new gate and my wife watched the bags. Then I took the kids on a train ride. We wandered aimlessly for a bit over on the A concourse, and then came back when it was getting closer to boarding time. Once again, we had a chipper gate agent. Being a bit later in the day, I was somewhat more receptive to it than I was that morning. We again did family boarding, and this time we picked seats on the other side of the aircraft. The lead flight attendant was a jokester in the old Southwest way. I was surprised when he told me he had only worked for the airline for three years. The airplane had arrived a bit late, and they lost a little time on the turn, so we pushed back 10 minutes late. We were sent to runway 8 which launched us straight toward Charleston. The clouds were thick on the way up, and we bounced our way through them. Once we got above the clouds, however, things smoothed out nicely. The flight attendants came through with drinks, Wheat Thins, and pretzels. This time I sat next to my daughter who was also happily distracted by her tablet. I again turned on live TV, but the offerings were a bit thin since it was mid-day in the middle of the week. I’m not sure why I thought this flight would be so much longer than it was, but at under 3 hours, it went by pretty quickly. South Carolina was in the thick of its seemingly normal summer weather… scattered thunderstorms all over the place. Fortunately, most of the activity that day was further north. The clouds did start building up around the South Carolina border, and we darted in between storm cells a couple times. Once we got low enough, we could see the lush, wet, green land below as the sun hid behind the towering cumulonimbus clouds. We landed hard (and the flight attendant joked about it), and then we were in for a real surprise. You’d think Charleston wouldn’t have a gate issue, but with so many delayed flights up to the northeast that day, we had no gate. They sent us to the penalty box. The pilot came on and seemed frustrated that he didn’t even have an ETA for us. I went on my phone and looked up departures. We were in the penalty box around 4:45pm and that Southwest airplane on our gate wasn’t supposed to leave until 5:15pm. Ouch. The captain came on and said the gate next door would be opening up sooner when Frontier left, and they were going to move the airplane on our gate over there so we could go into our original gate. What a strange plan. A few minutes later, he came on to tell us cooler heads prevailed and we would just go into the new gate once the Frontier aircraft moved. Finally Frontier got out of the way and we got to the gate. The flight attendant came on and then shouted “GET OUT. Oh wait, that wasn’t very nice. Please… GET OUT.” It’s hard to have this come off well through writing, but it really worked with the mood onboard. He earned some well-deserved applause. We stepped out into what appears to be a really nice little terminal, but we didn’t stick around long to inspect it. We needed to hit the road. National doesn’t have an Emerald Aisle in Charleston, so we took the Altima they handed us and walked out into the steamy afternoon. On the way out of the airport, I had to do a double take. Was that a Hainan 787 departing? Oh right, they build 787s there. We saw a flight line with quite the view of 787s ready to go. After that, it was off to the wedding in Folly Beach, a great little beach town south of Charleston. We then went to see my in-laws in North Carolina and then kept going to Raleigh/Durham for our flight home. I think CF meant the first ticket (with which the free companion ticket is associated) was $257.80, the second and third tickets were $297.80 each, and his wife’s companion ticket was $5.60 for the taxes. It took me a couple of reads too. Yep that’s right. Sorry it wasn’t more clear. I like that you took the kids on a train ride during the layover. Great way to keep them entertained! LAX Terminal 1 looks fresh. I have to wonder though if 20 years from now we’ll see those linear LED accents and say “that’s so 2018” just as neon tubes are dated today. Fun drive up US 17 from Charleston to Brunswick County? I’m really impressed with Charleston’s airport, but that’s the first I’ve ever heard of gate delays there. Patrick – Yes indeed! Driving through Myrtle Beach was… interesting. But I love getting off the interstate. Chuckled at your comment upon landing in Charleston, “we could see the lush, wet, green land below”. Family members who live in the desert in Calif. are always wide eyed when they visit me in ‘the city in a forest’ here in ATL. Great trip report, thanks! from the air, Dallas looks like a desert right now, but in fact, it is grass. very very dry grass. My lawn is like walking on Fritos. Glad I’m not the only one who takes my kids on airport train rides just for fun and to kill time. A couple of weeks ago, we went as far around PHX as you can inside security on the moving sidewalks and then rode the short train back and forth from the Southwest/C gates to the main terminal at LAS on the way home. Also glad to hear there are more of the funny Southwest flight attendants lately. On the same trip I referenced, we had hilarious flight attendants on 3 of our 4 legs. Always love your trip reports! Train rides are the best airport child entertainment there is. Cranky, you’re not the only one surprised that DEN-CHS is less than three hours. I would have expected four-plus. Surprised when I looked it up that it’s less than 1500 miles. I guess Denver is more geographically central than I think of it as. Oh, what I would have given as a kid to have been able to take all those wonderful trips your kids have taken! 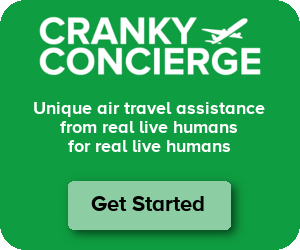 Never had parents like Cranky, but as time rolled on, I’ve enjoyed lots of great flights my parents never got to experience. As to fares, I see fare increases, $5 to $10 every week on so many, many routes over the recent months, to the point where, at these fare levels, I’m simply not flying anywhere. From what I can understand, planes are still very, very full, so some people are paying these higher fares. Anything to suggest things might be changing down the road? Jaybru – It’s entirely based on supply and demand. If demand drops, then fares will go down. There has already been some weakness this year and airlines are tightening up on capacity to offset the revenue issues. Did you snap any pics of those 787s? Eric – Nope, sadly. I was driving so I couldn’t. Cranky, you really need a power bank. 20 bucks from Amazon (I like Anker, but plenty of other brands are solid too). Use your phone across the country with no danger of running out of juice.